I have been using filters in my landscape photography for the past 15 years. They are an essential part of my equipment despite all the advances in digital photography. Yes, it’s possible to combine multiple exposures in software but there are significant benefits to using photo filters. It’s usually much better to balance the exposure in camera as it helps with composition; you can see the image more clearly, especially if using the back of the camera. It also better to capture a single image where there are moving objects in the scene than trying to combine multiple exposures. Some filter effects such long exposure or polarisation can’t be simulated in software. For most of my time using filters I have been an advocate of the Lee filter system. When I was first got started in Landscape Photography, most of the professionals I admired used the Lee filters and recommended them. I reasoned that if they were good enough for them, they would be good enough for me. Whilst I still believe that Lee filter systems are good, I realise there are now better options. Most recently I have discovered Kase Wolverine filters and decided to switch to using them. This has been a costly move but one that I’m certain is a good investment. To best understand why I made the switch to Kase Wolverine you need a little background about my historic filter use. Initially, probably for around 2 years I didn’t use filters. It was only when I started shooting landscapes using slide film that I realised I had a problem. I would typically find the ground was dark and the sky would turn white. This is when I decided to invest in some Neutral Density Graduated filters (ND Grads). Initially I baulked at the cost of the Lee system and decided to buy cheaper filters. At the time there wasn’t much choice (unlike now) and I opted for the Cokin P series filters. I quickly discovered these didn’t offer me the range of options that I needed in my photography often being too strong or too weak for the conditions. In fact, Cokin only offered two strengths of filter at the time, strong and mild. I also quickly found they produced a nasty colour cast under some conditions and many of my photographs were ruined. Cokin then brought out a set of 3 ND Grads in strengths we would recognise now. There was a 1 stop, 2 stop and 3 stop filter. I bought these and found the results were much better. But after a few more months I started to notice strange colours starting to appear in clouds. This became more noticeable when I used them with my first digital camera. I decided it was time to switch. Despite my experience with colour cast and knowing the professionals were using Lee, I resisted buying them as they were (and still are) very expensive. Instead I search for alternatives and found Hitech filters, also known as Formatt filters. They offered a good range of ND Grads at what I thought was a reasonable price. I started using these filters on a more regular basis and found my results improved. Initially I wasn’t experiencing any colour cast except under some unusual lighting conditions. Unfortunately, I found that the filters were prone to being scratched as they were made from plastic and I needed to replace them regularly. Sometimes when buying replacements, I would find the new filters had a colour cast and weren’t neutral. It’s very frustrating to find when you get your image home and view them on a computer that the sky is a purple colour. It’s also very difficult to correct. After persevering with Hitech for a little while I decided to cut my losses and invest in the Lee filter system. This was quite an initial investment, especially as I was buying the 100mm filters. As soon as I started to use them though I recognised they were an improvement on the filters I had been using. The filter holder was well made and easy to fit/remove. Most important of all, the filters appeared neutral under most conditions. Later I supplemented the 100mm system with the newer Lee Seven 5 system. These seemed of an equal quality but were a better size for the small Micro 43 cameras I had begun to use. Whilst the Lee filters have served me well and I have stuck with them for at least 10 years, they haven’t been without issue. The main problem I’ve experienced with these filters is scratching. Being made of resin seems to make this a particular issue. I have ruined countless filters by dropping them or finding a piece of grit in the filter pouch has scratched the surface. The scratching problem becomes most noticeable when shooting into the sun. The surface of the filter seems to become covered in micro scratches which cause flare, particularly if the sun is in the scene. I have also noticed that even when the filters haven’t been scratched but are a couple of years old, they have started to discolour. I’m wondering if the dye used for the filter is degrading or if the resin filters are starting to draw in pollutants from the atmosphere. You see a similar effect with glasses today (usually made from optical resin). After a couple of years, the lens will become yellowed from pollution and can be easily seen when placed against white paper. Having experienced problems with all the filter systems I’ve used I wasn’t very happy when I decided I needed to replace a couple of my ND Grads. This looked like it would be a costly exercise and one I didn’t want to repeat every frequently. I needed to decide, do I continue to invest in Lee filters or do I try to switch to a new brand. 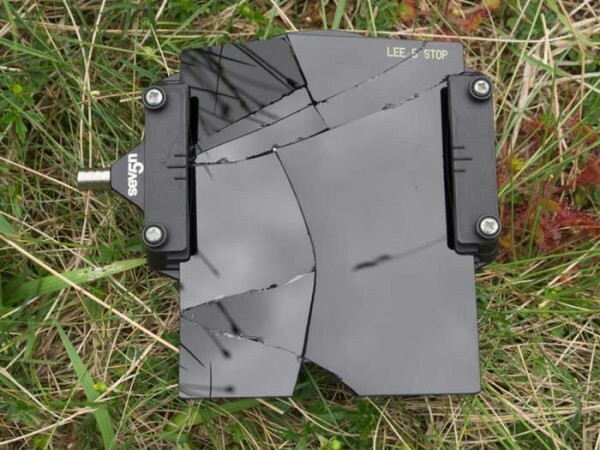 Ideally, I wanted glass filters as they are more resistant to scratching, but cost more and break easily if dropped. At the time I was making this decision I tried a friend’s glass filter system which was made by Nisi. The results were noticeably better and very encouraging. What I liked most was the quality of light through this glass filter. But the reservation I had about glass filters is how easily they can be damaged. Just look at the filter below. The holder popped off the front of my lens (I was no where near the camera at the time) and the filter hit a small stone on the floor, smashing it. This experience made me rather reluctant to buy glass filters even though they looked to be better than resin. I did consider buying one the Wolverine kits but then decided my investment was better made in individual filters. I already had the 100 mm Lee system holder and adapter rings and the Kase filters were the same size. I also have an excellent 105mm polarising filter for the Lee holder. This would be redundant if I switch to using the Kase filter holder, although the kit does include a nice polarising filter. Trying the Wolverine filters in the Lee holder, I found that they would gradually slip through the slots. This wasn’t a problem though as the case representative I purchased filters from also supplied replacement slots when I mentioned my plan to use the Lee holder. These slots are a direct replacement for the original slots. You simply remove the screws from the holder and then screw in the new slots. Once in place you can use the holder with either Wolverine glass filters or the Lee resin filters. On first using the Kase Wolverine filters, a couple of things hit me immediately. The first was how the glass has excellent light transmission qualities. The second was that the filters appeared completely neutral and didn’t change the colour of the image at all. Switching to the Lee filters to make a comparison, the image didn’t seem to have the same quality to it. This is hard to describe as I haven’t noticed this effect before. I’m finding that there is very little flair produced with these filters. I’m finding I can shoot directly towards the sun without affecting the quality of the image. I can’t recall having been able to do this using resin filters. And after a few outings with the filters they are still spotless. There isn’t a mark on them and I suspect given they are scratch resistant, this will continue to be the case. I know it sounds odd, but I’ve noticed there is a waterproof quality to these filters. Where rain falls on them it beads up and rolls off. With my traditional resin filters, I would often be cleaning them constantly in wet conditions. With the Wolverine filters I now find I can shoot for much longer periods without needing to wipe them. As for the shatterproof qualities of these filters I can report that they seem to be living up to the guarantee. I have dropped one of the filters twice now and there is no damage. I’m hoping not to test this feature any further as my heart stops each time I drop one. Despite this it’s good to know that they are shock resistant. It’s been a couple of months now since I switched to these filters and I have decided to extend my investment. I will certainly be buying the Reverse ND Grad may pick up a couple of others. I think for the moment I will continue to use my Lee filter holder, but I may consider upgrading this in the future. As you can probably tell from this review I am extremely impressed by the Kase Wolverine filters. So much so, that I have asked to become a distributor in the UK. You may feel this throws my neutrality into question and you would be right this question. I may not be able to convince you of this, but I will leave you with one thought. I would never recommend something I thought was substandard, let alone seek to sell it. I value my reputation too much. If you’re interested in purchasing Kase Wolverine filters you can find further information in my Lenscraft shop. If you have questions or would generally just like to discuss the filters please feel free to email me via the contact page. I have been looking at Kase filters as I have Lee and had problems, once like you the holder fell off the lens when I was not even touching it, I reported it to Lee and did not get much response, only a small discount on some filters, I see Lee have redesigned their holder now. I see a few others have had similar issues. Anyway I consider Lee too expensive for resin filters, which break or scratched easily, I have had several that been damaged, so unbreakable is a good idea. I will replace them gradually but I’m a bit confused about Kase fitting in the Lee holder, do I need to buy the Kase rails? Hi Ray, you can use the Kase filters in the Lee holder using the existing rails but sometimes they slip because of their weight and coated surface. In my Lee holder, the existing rails didn’t grip the filter firmly enough but in a couple of other holders I’ve tried they were fine. If you’re going to use them with a Lee Holder we can include the replacement rails at no cost providing we know they are needed. But in all honesty, if you can afford it I would recommend the Kase K8 holder (which also comes in the kits to keep the price down https://lenscraft.co.uk/lenscraft-store-2/kase-photography-filters-kits/). It’s a joy to use and the magnetic polariser is excellent. When I first started using Kase I struggled with the Lee holder vignetting on my wider lenses, especially if I used the polarizer. I haven’t had a single problem and the filters are very robust. I managed to drop one on a tarmac road last week and it bounced without a scratch – it was still heart-stopping though. Just a quick question as I’m probably going to get the Kase system. I notice they don’t have a 15 stop ND. Do you know if that is in the works, or can I use the Lee filter in the Kase holder? I’m interested in that strength of filter. I live in Florida and the sun is very intense here and it would be nice to have that extra stopping power. Thanks for your information! Hi David, No Kase don’t do a 15 Stop but they do a 16 Stop (ND640000) if you’re looking for something very strong (I have one and the quality is excellent). What I don’t know is if the US agent stocks them. You would need to contact them directly. Regarding your other question, yes you can use the Lee 100mm (2mm thick) filters in the Kase 100mm holder. BUT if you are using the Lee Big or Little stoppers, you will need to reverse them in the holder. These filters have a foam gasket on the back to provide a light seal. The Kase holder already has this gasket so the Lee filters catch on it. But if you turn them around so the gasket on the filter faces out you can use them fine (in my experience). Hope this helps. For my canon equipment (7D/5D) I was always using a Lee 100x150mm filter holder in a combination of Lee and Hitech resin grads, a Hitech 3ND, 10ND and square glass pol filter. I was not very happy with these filters being aware glass filters would probably solve most of the issues I had to deal with. Glass filters are much more expensive though and I’m convinced I would break them all. So no way to go either. Despite the pretty high priced KASE filters I’ve decided to replace my Hitech and Lee filters one by one during a certain period. But here is my problem. Last year I replaced my Canon equipment and moved to a mirrorless Fuji system. I expect problems using the 100x150mm grad filters on lenses which have a much smaller diameter. (the all do and especially the primes) These hard grads are probably no hard grads anymore and soft grads become useless…? When I move to a smaller filter system my whole investment in the 100x150mm gets lost more or less so I definitely prefer to keep this system. I’m convinced there is impact more or less but have no idea ho much or if there are ways to work around that. I’m very curious I you have any experience with this and to hear from you! Hi Fred, I’m pleased that you’ve found the benefits of the Kase system. As you’re probably aware I now use the Fuji XT2 along with a range of lenses; although mostly these are zooms. The Soft Kase grad is indeed very soft but I still find it very useful for darkening the sky where the horizon isn’t level, for example, there a mountain in the scene. This isn’t really possible with the Hard grads. Personally, I haven’t experienced any problems using the hard grads on the Fuji system. I was also out with one of the guys from Kase recently and he was shooting using an Olympus M43 system (which is his main camera) and the filters work great. Now before you rush out and buy all new filters, it may be worth holding off a few weeks. I believe there is a smaller size filter system on the horizon from Kase. I don’t have any details yet but when I do I will let people know and add them to the lenscraft shop. Hopefully, we should know more by the start of April.